Industry advocates have long been arguing that the Forest Rights Act (FRA), which recognises the rights of tribal and forest people over forests, is hindering the country’s growth by “stalling” industrial projects. Ministers and officials in the BJP-led alliance government at the Centre have been using this growth argument to push for dilutions in the law. But in reality, the situation is completely different from what is being projected by industry, as was revealed during the National Convention on Community Forest Rights held in Delhi on December 16. The event was attended by forest-dwelling communities of different states and organised by Community Forest Rights Learning and Advocacy Group, an alliance of organisations working on forest rights. FRA, passed by Parliament in 2006, requires that recognition of traditional rights of the tribals and forest dwellers on forestland should be completed before the land is considered for diversion to non-forest uses, including industrial use. Once the rights are recognised, a process is to be worked out to handover the forestland after compensating the right holders and obtaining their consent. This was done to ensure that the “historical injustice” done to the tribals by denying them rights on forestland and its resources by the government and the industry in the past is corrected and does not get repeated. However, the governments and the industry are not following this due process of law when it comes to forestland diversion. In fact, the implementation of FRA, it seems, is being held up deliberately in areas where big-ticket projects are planned. Take for instance the Polavaram dam project on the Godavari river in Andhra Pradesh. The community forest rights (CFR) claims of villages over forests that would be submerged on commissioning of the Polavaram project were approved by the gram sabhas (village councils), the highest decision making bodies at the village level, more than two years ago. The claims, since then, have been pending with the state’s divisional and sub-divisional level committees (DLCs and SDLCs) comprising government officials; these committees were formed under the law to approve the claims. At least 276 villages will be submerged on commissioning of the Polavaram multi-purpose dam, according to official estimates. “The officials tell us that the forest rights cannot be settled in our villages because they come in the submergence area,” said one of the project-affected tribals attending the convention. Testimonies from the forest dwellers who participated in the convention from other states are similar. In Chhattisgarh, SDLCs and DLCS have not been entertaining community rights claims in areas proposed for mining. In Korba district, where memorandums of understanding have been signed between government and private companies to establish 39 power plants, not a single community forest right has been recognised. In Odisha, the community forest rights claims of Pauri Bhuyan, a particularly vulnerable tribal group, on Khandadhar hill, which they consider to be their sacred habitat in Sundergarh district, have not been accepted for the past more than two years. Over 2,000 ha land in Khandadhar is proposed to be mined by Posco India to extract iron ore for its proposed US $ 12 billion steel plant in Jagatsinghpur district. In fact, in many cases in Odisha, the gram sabha proceedings have been manipulated or forged to allow forest diversion for industry without settling the forest rights, informed the participants. In a letter written to the Union ministry of environment and forests in May this year, the ministry of tribal affairs had pointed out that the collector of Keonjhar district had called for meetings of gram sabhas affected by a mining project of Essel Mining and Industries Limited earlier this year to take their approval for the diversion of forest. In the same meetings, which were also attended by the mining company representatives, it was decided that the forest dwellers in these villages had no forest rights claims despite opposition from people. In Madhya Pradesh, the tribals in the Mahan forest in Singrauli, are not being allowed to file the community forest rights claims for past almost two years. More than 900 ha of forests were proposed to be mined in Mahan by Mahan Coal limited a joint venture of Essar and Hindalco industries till the Supreme Court of India cancelled the allocation of 214 coal blocks, including the one in Mahan, due to the irregularities in process in September this year. (see ‘Life after colagate’) “None of the officials cooperated with us in the process of filing the community rights claims. When we asked for the data and maps of the forest boundaries to substantiate our claims, they would tell us there was no need to file FRA claims as, according to them, we were already enjoying the rights on the forests,” said one of the representatives of the Mahan Sangharsh Samiti (MSS), an organisation of the forest dwellers affected by the proposed coal mining. “When finally we managed to file CFR claims in five villages about four months ago, the collector offered us a settlement package in consultation with the mining company without going through the due process of FRA. Now that the coal block has been cancelled there is no talk of even that settlement package,” added the MSS member. 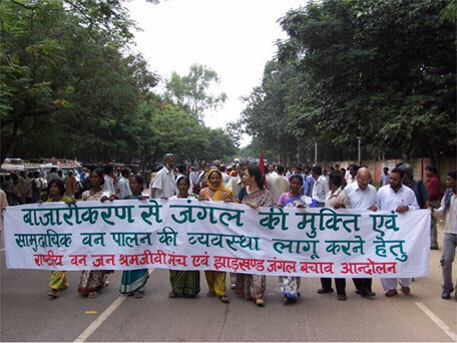 Organisations working on forest rights in Jharkhand informed that FRA is hardly being implemented in Saranda forest where proposals for mining iron ore on about two-third of the 80,000 ha forest land are pending at different stages (see ‘Saranda for sale?’ https://www.downtoearth.org.in/content/saranda-sale). Interestingly, the industry proponents have been advocating against the implementation of FRA, saying it denies the tribals the benefits of development that would come from industrial projects in their lands. But inexplicably, they have been insisting on bypassing the requirement of consent of the affected people for such projects under FRA, which also gives the project proponent a chance to explain the benefits of their project to the people. In fact, it is the bypassing of this crucial requirement which has led to billions of dollars of investment getting stuck in projects like Vedanta’s aluminum refinery and Posco’s steel plant in Odisha. The government had to quash the approval given by it to Vedanta’s bauxite mining project in Niyamgiri hills after the Supreme Court directed it to take the consent of the affected Dongria Kondh tribe who consider the Niyamgiri hill their sacred habitat. The tribe rejected the project. (See ‘Battle over Niyamgiri’). In the case of Posco, the government has not been able to acquire land because of protests on ground. A recent study by the Delhi-based non-profit Society for Promotion of Wasteland Development and Rights and Resource Initiative, a global network of organisations working on forest rights, shows that between January last year and June this year at least one fourth of the total 664 districts in the country have been embroiled in land related conflicts arising out of the government takeover of land on behalf of private companies (see map). To make matters worse, the Union environment ministry has been issuing circulars to make exceptions for the projects from taking consent of the gram sabhas under FRA. About a year back, the ministry exempted linear projects such as roads, railway lines, transmission lines passing through from the requirement of taking permissions of gram sabhas. While impacts of this decision on forest rights were being debated, the ministry issued instructions in October this year to states to do away with compliance with FRA for the projects coming up in “plantations notified as forest on a day less than 75 years prior to December 13, 2005” and where forest dwellers other than the scheduled tribes are residing. Forest-dwelling families other than scheduled tribes have to prove their dependence on forests for at least 75 years prior to December 13, 2005 to be eligible for rights under FRA. While technically these circulars are being issued by the ministry to fast-track development projects without having to amend FRA, they effectively exclude the participation of forest dwellers in decision making on development process, which has essentially been the spirit of FRA. For these reasons, forest rights activists argue that the ministry circulars dilute FRA. The Union tribal affair ministry has now taken up the matter with the environment ministry, saying the circulars issued by it exempting certain projects from FRA compliance are in violation of the law. In a letter written the environment ministry officials in October, Hrushikesh Panda, the tribal affairs secretary, said “no agency of the government has been vested with the powers to exempt application of a law”. “We will make sure that FRA is not diluted,” he said at the national convention. It is yet to be seen if the ministry can succeed in ensuring compliance with FRA in the cases of diversion of forest land to the industry and if the BJP government can include the spirit of FRA in its agenda of fast-tracked growth. 1. When communists are butchering thousands of acres of Forest lands in Khammam district, why no body raised a hue and cry? Does this not come under tribal rights? Only if the forest area submerges for a project then it comes under tribal act and needs permission from villages!!! For, butchering the forest land tribal villages permission is not required, is it so!!! 2. Polavaram Project has got environmental clearance under 1994 EIA Notification. The Tribal act came in to force in 2006 and also new EIA Notification come in to force in 2006. -- 19 Sep. 2005 MoEF clearance for land [site clearance]; Public hearing [at five places] on 10 October 2005; 25 Oct. 2005 EC from MoEF; July 2006 Forest & Wildlife Clearance; August 2007 Central Tribal Welfare Department Rehabilitation clearance; Dec 2008 MoEF's 1st phase Forest Clearance; January 2009 CWC Technical Advisory Committee (TAC) clearance [1st Time); Feb. 2009 Finance Commission Investment Clearance; Mar 2009 the project getting assistance under accelerated irrigation benefits programme (AIBP); 28 July 2010 Forest Clearance by MoEF; 1978 August 4 AP, Karnataka & Maharashtra agreed on transfer of 80 TMC -- Bachawat Tribunalalso agreed; AP, MP & Orissa agreed for 150 ft height of the dam and associated submergence -- as proposed by Bachawat; 1979 Oct 10-30 ft height Karakattas 30.2 km in Orissa and 29.12 km chhtisgarh [former part of MP] and AP expressed its willingness to pay 600 crores towards this; 1980 Central Government in writting has given for 150 ft height of the dam -- on this orissa government signed. 4. Instead of asking better R & R packages, people wanted to support the peoplerunning illegal activities in this region and earning thousands of crores each year and the tribals are leading a miserable life -- no medical facilities, no education, etc.